The laboratories conducting these tests were commissioned by various companies involved in the original formulation and manufacture of the Copper-Zinc filter media known as KDF. Each test describes the purpose and procedure used as well as the results. Please contact us for complete documentation on any of the tests shown here. Water treatment devices may be colonized by bacteria and thus promote the growth of bacteria contained in the influent water. It is important, therefore, that devices that are intended for use in potable water supplies be tested to determine if they are bacteriostatic (i.e. do not stimulate the growth of microorganisms). The testing protocol used is described in Table 1. This procedure provides a heavy bacterial challenge over a seven day period followed by a period of time to allow the growth of the challenge bacteria. If the treatment device provides an environment that is favorable for bacterial growth, there should be a demonstrable increase in bacterial numbers during the latter stages of the test. In order to test the device, [a] model water system was used. The supply water for the model system was chlorine free deionized water that was reconstructed to approximate Detroit city water by the injection of AOAC synthetic hard water to achieve a final concentration of 100 ppm and a pH value of 7.0. A fresh suspension of Enterobacter aerogenes (former name Aerobacter aerogenes) was prepared daily and injected into the flowing water stream to achieve a final bacterial concentration of 300 cfu/ml. The results of the 19 day bacterial challenge test are shown in Table 2. For the first seven days Enterobacter was injected into the influent water stream and the survivors that passed through the test device were measured. The were endogenous bacteria (naturally occurring water bacteria other than Enterobacter) present in the model water system at the beginning of the testing, and there was a large reduction in these bacteria as a result of passage through the water treatment device. 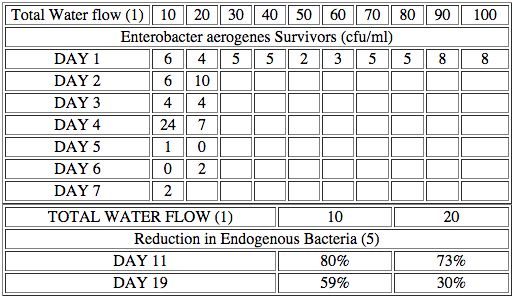 The results shown in Table 2 for the first seven days of testing show the Enterobacter survivors only. The measurements after 11 and 19 days, during which time no additional Enterobacter was injected into the system, the results in Table 2 show the percent reduction in these endogenous bacteria (no Enterobacter survivors were detected). This testing showed that the water treatment device is bacteriostatic and does not stimulate the growth of Enterobacter nor does it provide an environment that promotes survival. In addition, the device is effective in reducing the concentration of Enterbacter or other endogenous bacteria present in the influent water (bacteriocidal effect) and thus may be useful in the control of potentially harmful bacteria that may inadvertently enter potable water supplies. By: John W. Wireman, Ph.D. This is to certify that we have examined: Water Filtration Unit identified as WaterQuest Countertop0 (CT) to the requirements of NSF 53and found: When tested to the requirements of the applicable paragraphs of the National Sanitation Foundation Standard No. 53, “Drinking Water Treatment Units – Health Effects” the … unit met the applicable requirements of the standard. The attached Report of Test is an integral part of this Certificate. 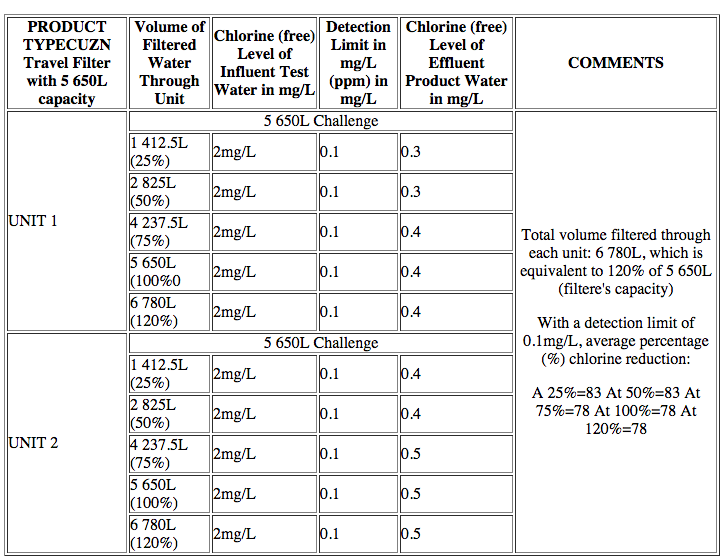 REPORT OF TEST 15712 of WATEROUEST, INC. WATERQUEST COUNTERTOP (CT) WATER FILTRATION UNIT CLIENT: WATERQUEST. INC.
CAVEAT NOTE: The values given in this report are the values obtained under standard test conditions and thus may be used for purposes of determining compliance or for comparison with other units tested to the same standard. The results do not indicate the function of the unit under non standard or field conditions. The material consists of metal filings identified as KDF-55D. The granules are clean, shiny and brass colored. The formulation is proprietary. Note: The following paragraph numbers refer to the corresponding paragraph numbers in NSF 53. Paragraphs not listed do not apply to this unit. 3.0 General: Materials which contact water shall be inert and not impart odor, color or taste to the effluent water. The materials and construction shall be appropriate for the use environment. Units intended for outdoor use shall not deteriorate because of sunlight. Complies. See construction materials section. 3.1 Temperature resistance. Units, for cold water use only small not deteriorate when exposed to 100 degree F water. Units for hot water use shall withstand 180 degree F water for continuous use or 165 degree F if for intermittent hot water use. Complies. The traits are not marked for restricted temperature use and were tested for mechanical properties at 180 degrees F.
3.2 Corrosion resistance: copper alloys, type 300 stainless, steels, Monel metal, and plastic materials (see 3.6) do not require a corrosion resistant coating. Complies. See materials of construction section. 3.6 Plastics: Thermoplastic and thermoset plastics wetted by the water shall comply with the require ments of the U.S. PF&DA and /or NSF Standard 14. 3.7 Joining materials shall meet the requirements of section 3. 3.9 Gaskets, O Rings, Shaft Seals and Packing Materials shall meet the requirements of section 3. 4.4 Dispensing outlet: Faucets, spouts or outlets integral with the unit (except drinking outlets, see 4.5) shall be designed such that when the unit is installed as directed by the manufacturer the outlet will be directed downward and shall be a minimum of 1 inch above the flood level of the receptacle or sink. Complies. The unit is provided with an industry standard diverter valve which is used to replace the aerator on the end of the tap spout. In normal installations, the diverter valve, although it extends approximately 3/8 inch further than the replaced aerator, should not decrease the distance to the high flood level below 1 “. In the case of spouts which do not have an aerator, and are not threaded, the diverter valve cannot be used. Responsibility for compliance with the applicable plumbing code is the responsibility of the installer. Primary Drinking Water Regulations, or a similar standard established by any U.S. Federal regulatory agency for materials not included In the U.S. EPA regulations. No single sample shall exceed the MCL by more than the established analytical error for the method used. 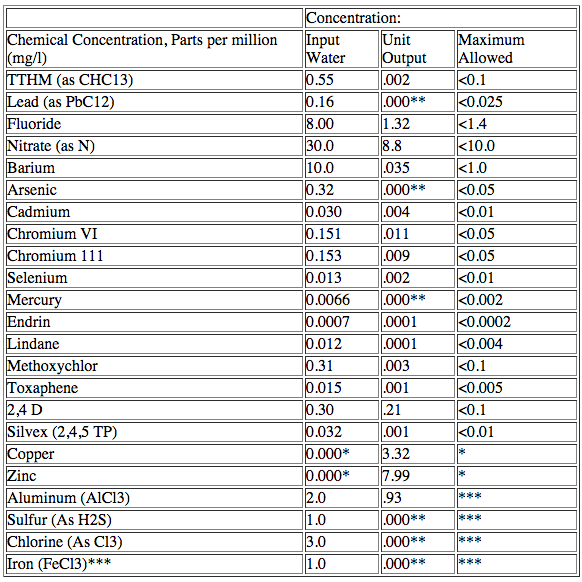 5.2.1 Chemical reduction: Shall reduce the specified contaminants as shown in Table 1. Note: Since it was known that the sample material has little, if any, effect on organic materials, the test was continued using the challenge water until any one of the metallic inorganic elemental components reached the maximum allowable effluent concentration. 5.1.2 Chemical: The arithmetic average of the active agent of each test unit shall not exceed the MCL of the U.S. EPA Primary Drinking Water Regulations, or a similar standard established by any U.S. federal regulatory agency for materials not included in the U.S. EPA regulations. No single sample shall exceed the MCL by more than the established analytical error for the method used. 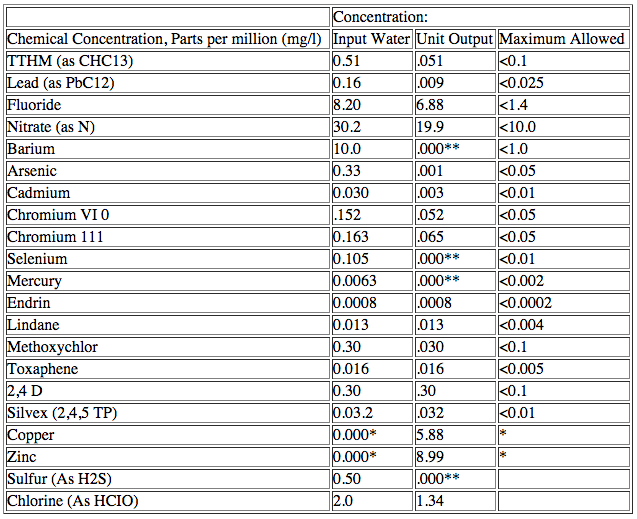 5.2.1 Chemical Reduction: Shall reduce the specified contaminant/s as shown in Table 1. *No copper or zinc were added to the challenge water; no present acceptable levels are set for these elements, however it is anticipated that standards will be established. “Below limit of detection. ***Added because of advertising claims. 5.4 Working pressure and hydrostatic performance. 5.4.1.1 Complete assemblies shall withstand a hydrostatic pressure equal to 2.4 times the working pressure or 300 psig, whichever is greater, for 15 minutes without leakage of water from the unit. Complies. When pressurized to 300 psig at 180 degrees F, there was no failure or leakage of the end of 15 minutes at pressure. 5.4.1.5 Valves and controls subject to line pressure shall be water tight at 150 psig pressure after a minimum of 100,000 pressure cycles of 0 150 psig at 70 =/ 5 degrees F. Does not apply. Although the unit is provided with a diverter valve which diverts the water flow from the faucet outlet to the filter, there is no closure valve on the outlet of the filter. No pressurization is intended of the system. 5.4.3.1 Withstand a hydrostatic pressure of 2.4 times the working pressure or 300 psig, whichever is greater, for 15 minutes without leakage. Complies. See paragraph 5.4.1.1 above. 5.4.4.1 Complete assemblies, with the outlet plugged, shall withstand a hydrostatic pressure of 1.2 times the working pressure of 150 psig, whichever is greater, for 15 minutes without leakage. Minimum design burst pressure is equal to 4 times the working pressure or 500 psig, whichever is the greater. 5.5 Filter media: All finer media which may be subject to plugging shall be supported to withstand for 15 minutes a pressure differential of 75 psig or a pressure differential equal to the maximum pressure drop the product design will permit when installed under a line pressure of 125 psig without breakdown which would permit the passage of untreated water or media into the effluent. Filter Media Test Input turbidity: 11 TU Effluent turbidity, initial* 0.7 TU Effluent turbidity, 50 % 0.8 TU Requirement: Effluent turgidity to be 1.0 TU or less; Effluent shall contain no media. *The unit was purged prior to test to remove carbon dust. 5.7.1 The rated service flow shall be as specified by the manufacturer. Complies. Installation instructions are provided; there are no user maintenance requirements. 6.1 The units must be labeled in compliance with the requirements of this section. 6.3 Purchase and sales information must comply with the requirements of this section. Acceptance Criteria: For appliances claiming taste, odour and chlorine reduction, both units tested 11imultaneously shall reduce an influent challenge level of2.OmgIL free available chlorine to 75% or greater throughout the test period, to be classified as a Class I appliance. 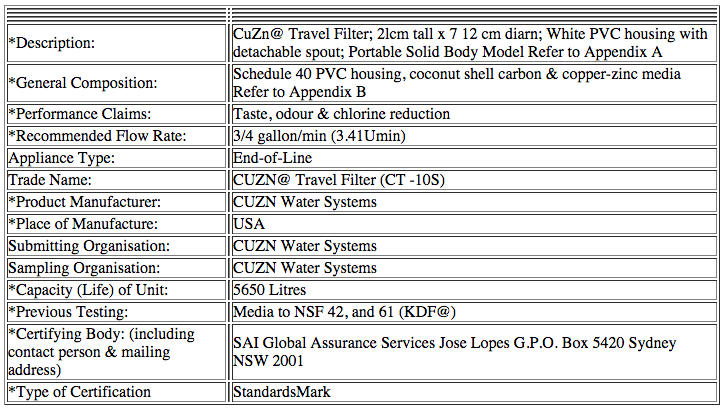 Based on the above results and the acceptance criteria, the product, CUZN Travel Filter with white PVC housing and detachable spout complies with test requirements of Section 5.0 and Appendix D as a Class I appliance when challenged with 5 650L test water. Our plumbing reports are recognised by SA! Global Assurance Services for Product Certification to AS/NZS 4348:1995 Compliance testing. Manufactured by CuZn Water Filtration Systems Inc. Note: The CSIRO accepts no responsibility for the selection of specimens. The results in this report apply to the specimens tested and may not be applicable to other specimens of the same product. The specimens were tested and evaluated in accordance with AS/NZS3497:1998, Clauses 5.2, 5.3 and 5.4. The results for compliance with the specification are shown in the following pages under the relevant clause numbers. # Compliance with the specification could not be ascertained. ## Non-compliance with the specification. A tightening ring was supplied with each assembly, which was used in tightening the assembly prior testing. The specimens were subjected to a hydrostatic pressure of 2070 kPa for duration of 15 minutes at ambient temperature. Specimen UC-200 showed no sign of leakage or damage. Note: The connection joint of the hose to filter showed slight leakage during the test. The specimens were subjected to a pressure range of 0 kPa minimum to 1034 kPa maximum cyclic test, for 10 000 cycles. Specimens showed no sign of damage. The specimens were subjected to a hydrostatic pressure of 3500 kPa at ambient temperature.